The Morgana BM350/500 is a modular booklet making solution for centralised reproduction departments and commercial print providers – large and small. Customers can choose from a range of cost-effective options to support their application requirements. The system is packed with a host of unique technologies that deliver finished books with quality to match today’s printing systems. 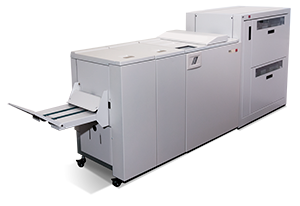 Dual Bin Feeder Options – The high capacity AF602 or VF602 dual bin feeder, or the ACF510 gives the ability for long uninterrupted runs of booklets. The bins can be loaded on the run with pre-collated sets from multiple print engines.